Although timber production in the South more than doubled from the 1960s to the late 1990s, output levels have declined over the last 10 years, signaling structural changes in timber markets. For softwood products, production declines are most clearly related to demand issues. Demand for softwood solid wood products is strongly linked to housing markets, and a sharp decline in construction beginning in 2007 reduced timber demand, a short run adjustment. Demand for pulpwood in paper manufacturing has declined as the production capacity has dropped in the South, a long run adjustment. As demand declined, investments in softwood production continued to expand, leading to supply growth for all softwoods, but especially for softwood pulpwood. The net result was a substantial reduction in softwood pulpwood prices. 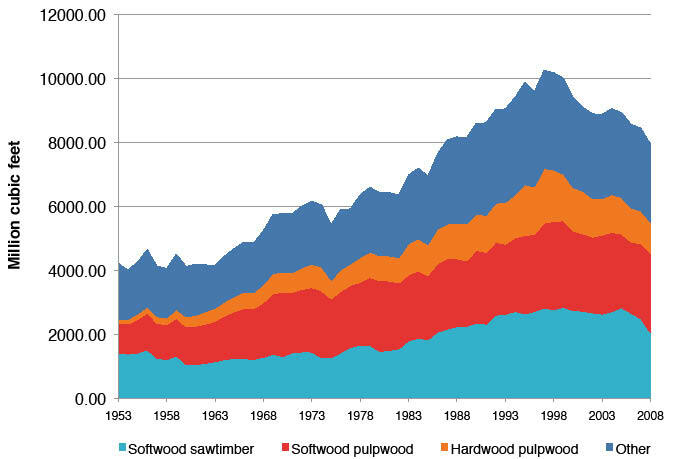 In contrast to softwood products, hardwood pulpwood output declined and its price increased in the 2000s, indicating a contraction of supply, especially in the Coastal Plain where paper production is concentrated. Several forecasts of timber markets show expanding supplies of softwood timber, especially softwood pulpwood, as new plantations mature and additional plantations accumulate across the South. 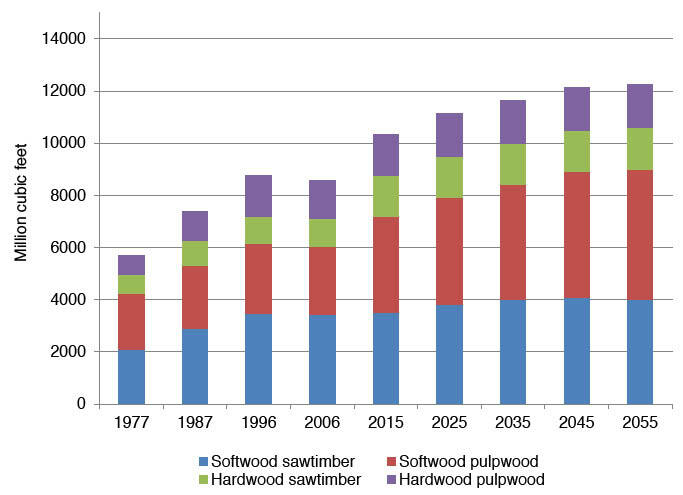 Across all forecasts, softwood pulpwood supply expands through the next 40 years, while softwood sawtimber supply grows over the next decade and then stabilizes. Forecasts of hardwood supplies indicate a gradual contraction as urbanization shrinks inventories. If timber product demand returns to and stays at the 2006 levels, total timber production is forecasted to expand by about 25 percent over the next 50 years, with little impact on the price of softwood sawtimber and hardwood pulpwood. Softwood pulpwood prices would decline by about 50 percent. If demand growth returns to 1980s and 1990s levels, total timber production could expand by about 40 percent over the next 50 years, with the greatest gains in softwood pulpwood output. Softwood pulpwood prices stabilize at 2006 levels while softwood sawtimber and hardwood pulpwood prices would increase at an average annual rate of slightly less than 1 percent. Growth in demand, coupled with gains in the productivity of planted pine forests, would likely expand total timber production by about 70 percent, with the production of softwood pulpwood more than tripling. The price of softwood sawtimber would stabilize, the price of softwood pulpwood would fall at less than 1 percent per year, and the price of hardwood pulpwood would increase by less than 1 percent per year. Forecasts indicate that the South’s timber supply could expand if moderate rates of future forest investments are added to investments in forests made over the past 20 years. Forecasts for 2055 show that annual production of softwood pulpwood could increase beyond 2006 levels by an additional 2.4 billion to 3.7 billion cubic feet (36.6 million to 57.9 million green tons) without substantial price effects. Timber production has the potential to expand substantially in the South, but future markets are likely to be limited by demand levels. Bioenergy is a potential but highly uncertain source of demand. Recovery of housing-related demand for wood products remains a key uncertainty in the short run. Without an expansion in timber demand, private forest owners would be expected to eventually experience a strong shift away from forest management as investment returns diminish to the point where continued investments cannot be justified. Timber production from the South grew substantially and steadily from 1950 to the late 1990s. Although production has declined from 1997/1998 peak levels, the region still provides a majority of the timber products produced in the United States (Smith and others 2009). Rapid growth in production from 1970 to 1998 did not, however, deplete standing inventories of biomass because high growth rates and investments in agricultural-style forestry increased forest productivity—planted pine forests now represent 19 percent of southern forest land. Recent harvest declines raise questions about the future of timber markets, and recent policy discourse about the use of wood to produce energy on large scales suggests potential for uncertainty and structural changes in these markets. How have markets for forest products changed, especially in the past decade? What are the implications of these changes for the future of timber markets? How is timber supply projected to change? What factors influence the future of forest product demand and what are the implications for timber markets? How might markets develop in response to alternative scenarios for future supply and demand? Timber supply defines how landowners deliver timber to market in response to timber prices and, in the longer run, to a variety of other signals. Several factors make it difficult to analyze the timber supply situation, including the long production period involved in growing trees, the multiple benefits that landowners can derive from standing forests, and constant changes in the land base from which timber is produced. It is common to think of supply as simply the relationship between harvests and prices but these other factors need to be accounted for, especially when considering long run supply dynamics. Supplies of timber are ultimately determined by the intersection of the biological production capacity of forests and the preferences of forest land owners. This chapter describes alternative production possibilities by evaluating alternative assumptions about productivity. It also considers a range of producer behavior by considering alternative projections of forest investments (plantation replacement and establishment), based on the historical behavior of private forest landowners. Demand is an economic concept that relates the consumption of a commodity to its price. Economic theory indicates that less of a commodity is consumed at a higher price and that charting all the possible price-consumption combinations defines a demand curve. This curve, however, can be repositioned based on many factors other than the commodity’s price—such as income, prices of substitutes for the commodity, and changing tastes. In this chapter, we examine demand for timber products by analyzing the various factors that could alter demand relationships. We look closely at substitution possibilities, production capacity, and international trade as indicators of changes in domestic demand for timber products. Perhaps the most important uncertainty about the future of timber demand is the development of new markets for fiber in the production of bioenergy. As a renewable resource, forest biomass may play an important role in meeting goals established through renewable portfolio standards, and cellulosic feedstocks for liquid fuels have been targeted in 2008 Farm Bill and other policies aimed at increasing the use of renewable energy. Demands for wood for co-firing in coal fired electricity plants and for production of fuel pellets have already emerged, although biofuel production on a large scale would require technological advances. Chapter 10 addresses potential bioenergy futures in detail. Chapter 10 examines how demand for wood in the production of bioenergy could develop in the future, and we refer to that chapter in examining a full range of market futures. While evaluating market futures, we do not attempt to forecast the business cycle, in particular, the recovery from the 2007 recession and the return to historical trends in product demand. Rather, our focus is on long run trends and, ultimately, the implications for forest sustainability and the capacity to adapt to changing demand for fiber in the coming years and decades. The analysis of historical changes in timber markets presented here starts by updating the data from a report (Wear and others 2007) that examined basic price- and harvest-quantity indicators and interpreted patterns of change to provide general insights into market direction and trends in demand and supply. A set of explanatory factors that have affected the demand for timber products—including domestic conditions, technology changes, and international trade—places demand trends in context. An analysis of timber supply fundamentals focuses on land use, forest investment, and timberland ownership and their effects on the future provision of timber from private lands. Cornerstone A describes a future of very rapid economic and technological growth, combined with increasing timber prices. Cornerstone B is also based on rapid economic and technological growth but combined with decreasing timber prices. Cornerstone C is based on moderate levels of economic development and less rapid but more diverse technological change, combined with increasing timber prices. Cornerstone D is also based on moderate levels of economic development and less rapid technological change, but combined with decreasing timber prices. Cornerstone E is based on Cornerstone A but allows for an increased rate of planting following the harvest of naturally regenerated forests. Cornerstone F is based on Cornerstone D but with a decreased rate of forest planting following harvests. Harvest choice models are based on empirical models of historical harvesting linked to FIA plots in the South. The models are sensitive to changing forest productivity and prices that affect net revenues from harvest/no harvest alternatives. Using the Cornerstone Futures, simulations of harvests for a range of prices are summed across all plots to define the timber supply function (defined as the relationship between aggregate timber harvest quantities and their respective timber prices within a forecast period). Prices for softwood sawtimber, other softwoods, hardwood sawtimber, and other hardwoods enter the calculations (Polyakov and others 2010), and a set of empirical supply functions are derived for these four product classes. We used a modified version of the method outlined by Polyakov and others (2010) to construct aggregate supplies. 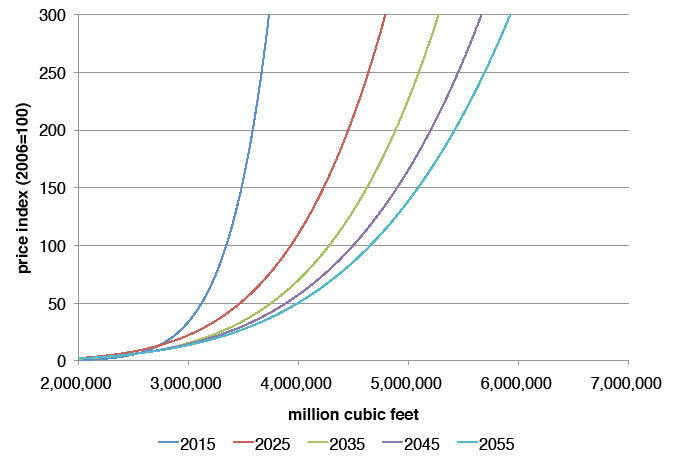 For a set of related Cornerstone Futures—for example, Cornerstones A, B, and E, that share the same population and economic growth futures but apply different price projections—we use the simulations to generate multiple supply realizations, specifically, a bootstrapping approach (employing random sampling with replacement) of simulations for each State in each time period that generates 1000 observations of supply. These realizations provide the data for regression equations where the harvest quantity for each product is modeled as the function of its price, and cumulative results for all products provide estimates of supply models in each period. We set up the equations so that the coefficient on price is the own-price elasticity of supply (the ratio of proportional change in harvest to the proportional change in price), and so that supply for each period reflects forecasts of land use change and responses to climate, disturbances, and forest succession. The U.S. Forest Assessment System models the supply of total removals from inventory, but our questions target specific product markets. Estimated quantities of products obtained from numbers of removals derive from utilization coefficients that translate sawtimber-sized removals and other removals into what we label sawlogs and pulpwood. Sawlogs are used in the production of lumber and veneer for panels. Pulpwood is defined as material delivered for use in the paper manufacturing and in other industrial processes—especially for fuelwood and for the manufacture of oriented strand board. The timber product output database (Johnson and others 2010) provides estimates of these conversion factors, which we adjusted to reflect the difference between chip-and-saw sawlogs from plantations and sawtimber products from naturally regenerated forests. Basic supply scenarios—We constructed two supply scenarios from the Cornerstone Futures, one labeled “High GDP” to reflect the strong economic and moderate population growth projections of Cornerstones A, B, and E; and the other labeled “Low GDP” to reflect the weak economic and low population growth projections of Cornerstones C, D, and F.
These forecasts of changes in forests are contingent on projections of timber harvests across private and public forested plots in the FIA inventory using market-driven harvest probability models (Polyakov and others 2010). Harvest predictions are driven by the price projections that are part of the assumptions that structure each of the Cornerstone Futures. We use these projections of harvests to estimate supply functions for the two fundamental economic storylines they embody. Associated forest condition forecasts and land use forecasts are described in chapters 5 and 4, respectively. Effects of productivity increases—The imputation approach adopted for the U.S. Forest Assessment System that undergirds our supply projections uses current observed forest productivity to construct forecasts. This is appropriate for short run supply forecasts, but recent research indicates that the productivity of pine plantations could expand over the next several years (McKeand and others 2003). Tree improvement programs have yielded genotypes with large gains in productivity and newly planted forests are expected to have even larger productivity gains (with additional crossing of superior parents). Tissue culture propagation along with other advanced genetic techniques may increase output per acre by even greater amounts. The rate of deployment of improved planting stock and the proportion of established plantations receiving intensive management throughout their rotation is unclear and compounds the uncertainty of any attempt to forecast productivity growth. To examine the potential contributions of this enhanced productivity, we adopted a straightforward simulation approach using an additive formula that increases productivity by 10 percent each decade, so that by the 2050s average productivity of planted pine forests is 50 percent higher than the current level. Although we expect increased productivity to eventually alter planting decisions, and therefore skew some of the decision models that undergird our analysis, we believe that this simulation approach provides a first approximation of long run production potential. We examine two different demand scenarios. The first—labeled Constant Demand—holds the demand relationships for timber products in 2006 constant over the 50-year projection period. This is consistent with demand stability for both paper and solid-wood products and would be consistent with some substitution within product lines. In effect, it is consistent with moderate (long run average) housing demand and the stability observed in pulp and paper markets in the late 2000s. Demand was modeled using a constant elasticity equation by intersecting the harvest-price observation for 2006 and applying exogenously determined own-price elasticity, always -0.5, as was consistent with the literature. Note that constant demand does not imply constant harvests. 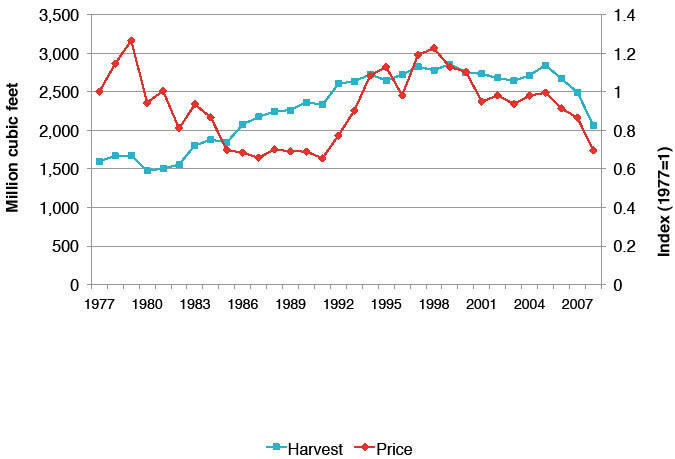 Rather it holds the demand relationship between price and harvest constant, so prices and harvests can vary over time in response to supply shifts. The second demand scenario—labeled Expanding Demand—examines a return to demand growth in the South. Under this scenario, product demand is assumed to return to 1996 levels by 2015 and then expand 10 percent per decade through the end of the projection period. This is roughly consistent with demand growth in the 1980s and 1990s. We did not construct these demand scenarios to address changes in world trade of forest products explicitly, but instead assumed that they capture range of market realizations that is useful for our projections, i.e., they should provide useful insights into the potential range of market responses over the next 50 years. For market forecasts defined by permutations of the supply and demand scenarios, we report forecasted harvests and prices for every decade. Inventory and removals are constructed on a decadal basis, with inventory reflecting the conditions at the end of the period and removals reflecting the average removals over the previous decade—for example, the 2030 inventory reflects removals occurring over the years 2021–30. All prices are in real 2009 dollars and harvest forecasts are, after applying conversion factors, comparable to the historical timber product output data and reported in summary reports (Johnson and others 2010) for the 2010 Resources Planning Act (RPA) Assessment. Historical harvest quantity data are derived from the timber product output system of the Forest Service, U.S. Department of Agriculture. Reports of roundwood output by region have been developed for the RPA National Inventory Database for the years 1952, 1962, 1977, 1981, 1996, 2001, and 2006 (Smith and others 2001, 2004, 2009). Comparable annual data for softwood and hardwood pulpwood harvests have been compiled for the South (Johnson and Steppleton 2005). We also constructed an annual series of softwood sawlog production by interpolating between the RPA reporting years based on the production of softwood lumber in the South as reported by the Southern Forest Products Association. To examine price trends we constructed regional price indices based on prices reported by Timber-Mart South for all subregions of the South. We constructed price indices by product class based on prices reported for intra-State areas by Timber Mart-South, with each index representing an average weighted by the inventory volumes of its associated geographic area. Throughout this paper we report prices in real terms, adjusted for inflation using the Consumer Price Index price deflator, with 2009 as the value basis. Indices of timber prices were also used to allow easier comparisons among product types. When indices were used, we defined 1977 as the base year (the index is set equal to 1 in 1977) and applied the indexing to the real prices described above. 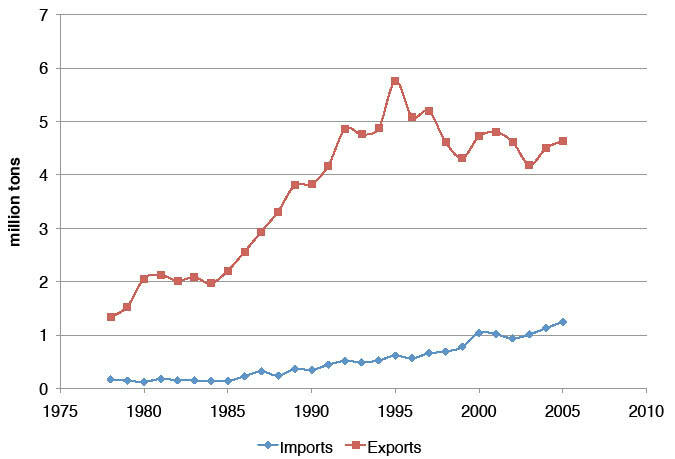 Trade data were taken largely from the database compiled by Daniels (2008), which summarizes extensive records on imports and exports from the U.S. Department of Commerce through 2005. Other secondary sources were tapped to provide data on exports/imports of selected products beyond 2005, wood products capacity, and various price indices. We start this section by examining how timber markets have changed in the South since detailed records have been kept (with emphasis on the most recent changes) using timber harvests and prices as summary indicators of development over time. 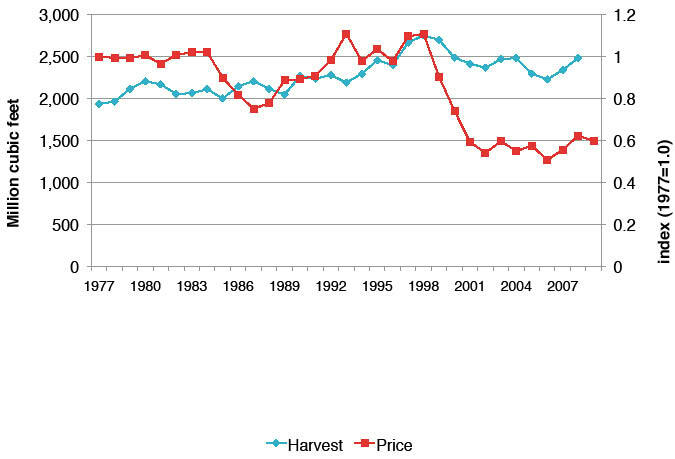 We begin by examining how harvest quantities and prices have changed, and where possible, deconstructing those changes into implied shifts in supply and demand to add context. Southern forests yield a wide variety of hardwood and softwood timber products. Softwood products constituted 71 percent of harvest output in 2006, the latest year for which comprehensive timber product output data are available(fig. 9.1). Forty-two percent of total harvest was for sawlogs and 38 percent was for pulpwood products. 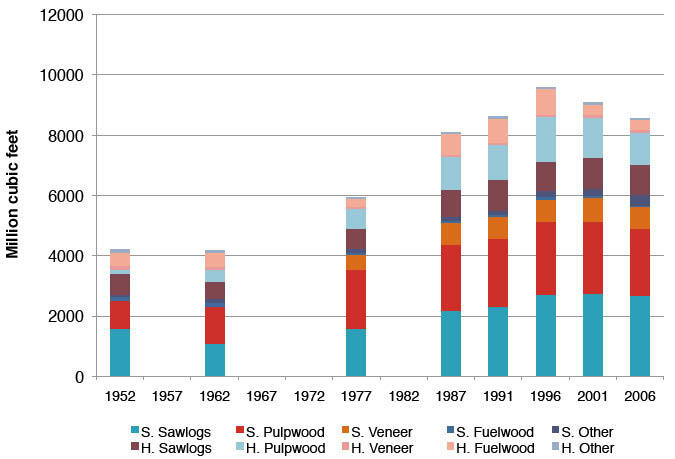 Softwood sawlogs comprised the largest product class (31 percent), followed by softwood pulpwood (26 percent) and hardwood pulpwood (12 percent); the three represented roughly 69 percent of harvests, continuing a trend that began in the 1970s (fig. 9.1). 44 percent from pulpwood and 64 to 71 percent from all softwoods, with no consistent trends. Growth in harvests for all products was steady from one year to the next with only a few exceptions (fig. 9.2), the most notable being a dip in output during a brief recession in the mid-1970s. Growth in harvests was at its strongest from 1982 through 1998, with output expanding at a compound rate of 3.3 percent per year. After this long period of strong growth, total harvest quantity fell by approximately 23 percent from 1997 to 2008, returning total harvest quantity to 1987 levels. This represents the largest and longest downturn in harvesting over the historical period (1952 to 2008). Trends in the three largest product classes (fig. 9.3) show that the harvest decline was led by reductions in hardwood pulpwood (a loss of 42 percent), followed by 27 percent for softwood sawtimber and 7 percent for pulpwood. 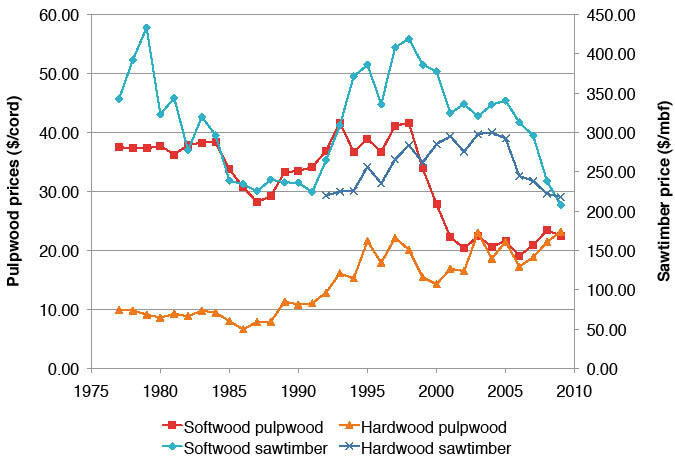 Most of the decline in softwood sawtimber production occurred since 2005 (fig. 9.3). We were unable to construct an annual time series of hardwood sawlog production (the fourth largest product class) using a comparable technique, but the periodic data (fig. 9.1) suggest that hardwood sawtimber harvests were relatively stable at least through 2006, with incomplete data suggesting substantial declines beginning in 2007 in association with the housing-related recession that began that year. Timber prices are an indicator of the scarcity of timber as an input to production, and they reflect the interaction of supply and demand: if stumpage prices increase, then timber becomes relatively scarcer. Conversely, falling stumpage prices indicate that timber is becoming more abundant relative to demand for its use. Prices for various wood products demonstrated a variety of trends from 1977 to 2009, the period for which we have comprehensive data, indicating that scarcity or abundance of these resources is a complex and evolving story. 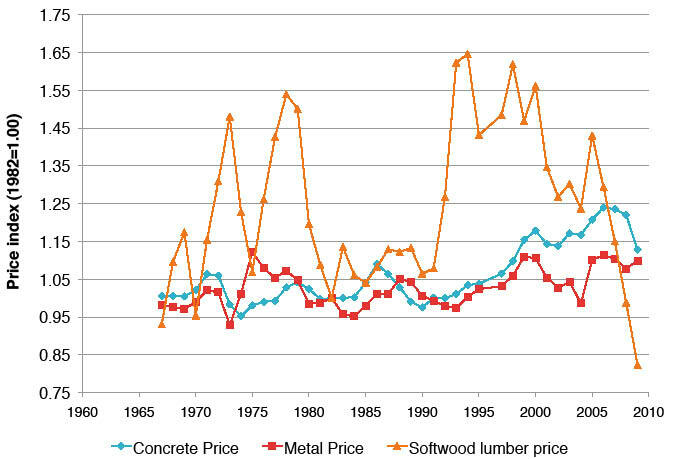 From 1977 to the late 1980s, timber prices were flat-to-declining for all hardwood and softwood products (fig. 9.4). 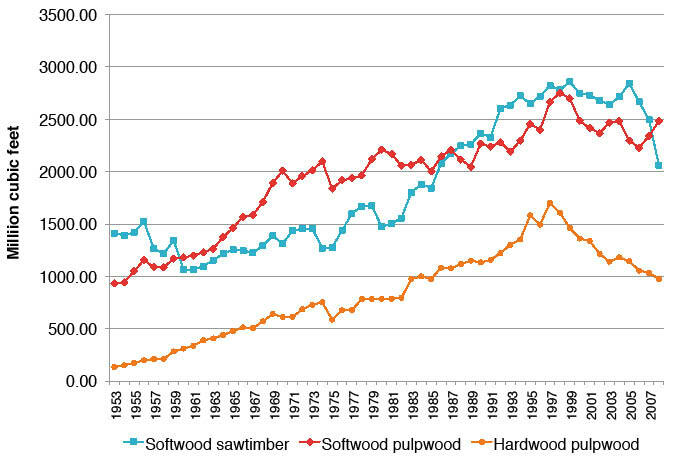 Compared to 1977, softwood sawtimber prices declined very slightly through 1991, softwood pulpwood prices were essentially flat through 1989, and hardwood pulpwood prices were flat through 1988. Harvesting grew at moderate rates (fig. 9.3), with no indications of increasing scarcity through the late 1980s. Price patterns began changing between 1989 and 1992 (fig. 9.4). Real-dollar prices turned upward for all four products and increased through 1997 or 1998, when production peaked. From 1988 to 1998, hardwood pulpwood prices increased at an average annual rate of 12 percent, followed by softwood pulpwood at 5 percent and softwood sawtimber at 8 percent. Hardwood sawtimber prices increased by 6 percent from 1992 to 1998. These price data indicate increasing scarcity for all timber products over the decade. From 1998 to 2009, hardwood pulpwood and sawtimber prices stabilized, and softwood sawtimber prices declined from their near-peak 1998 level (only exceeded in 1979) and from 2005 to 2009 reached their lowest level of the historical period. Softwood pulpwood prices have, however, followed a decidedly different pattern. From 1998 to 2001, prices for this product fell to about half of their 1998 value, their lowest level of the historical period, and have remained at this level through 2009. Changes in harvest quantities and timber prices since 1998 suggest that timber markets have been and continue to be dynamic. Softwood product prices have declined from their peak levels, but hardwood product prices have remained relatively constant. These price changes, combined with harvest patterns, suggest that returns available to most timberland owners are now substantially lower than they were in the peak years of the 1990s. For softwood pulpwood, these patterns suggest a contraction in pulpwood demand coupled with stable-to-expanding supply of standing pulpwood-sized timber. 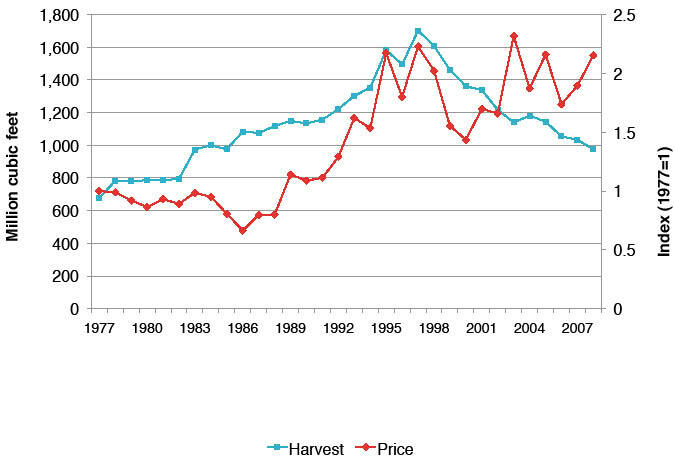 In contrast, hardwood pulpwood seems to have become somewhat scarcer; softwood pulpwood prices were about twice as high as hardwood pulpwood prices in the early 1990s, but the two products are now roughly equal in price (fig. 9.4). Looking jointly at price and harvest changes for the three largest product classes in the South (fig. 9.5), we can define three distinct periods of development from 1977 to 2008. Moderate growth phase (1977 to 1986)—During this period, harvests of all products increased at a moderate rate while timber prices stayed constant or even declined for all three of the major products. These trends are consistent with expansion of both supply and demand for the products—that is, forest investments generated additional wood supply and kept prices from increasing with output. Rapid growth phase (1986 to 1998)—During this period, harvests of hardwood pulpwood, softwood pulpwood, and softwood sawtimber continued to increase but at faster rates than the earlier period. Prices for these products also increased, and at a higher rate than for harvests. This pattern is consistent with a strong expansion in timber demand but does not provide conclusive evidence of change in timber supply. It is consistent, however, with demand expanding faster than supply. In contrast, production was stable but price increased for hardwood sawtimber, signaling a tightening of hardwood sawlog supply. between 1998 and 2001 and have remained at this level through 2009. Decreasing prices with a stable output is consistent with a strong expansion in the supply of softwood pulpwood. For softwood sawtimber, simultaneous declines in harvest and prices indicate that markets were dominated by a contraction of demand from 2005 to 2009, coincident with strong declines in the demand for U.S. housing construction. For several decades, the United States has produced more wood pulp than any other nation. In 2006, hardwood and softwood pulpwood made up 36 percent of the timber consumed in the South. The region’s paper mills are concentrated in the few areas where plentiful water is available. 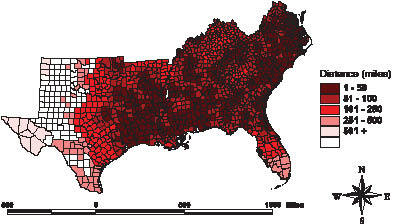 These areas include southeastern Georgia, northeastern Florida, and southern Alabama and Mississippi. Concentration of paper production capacity organizes the demand for pulpwood within the South: demand for pulpwood is strongest in the vicinity of mills and weakens with distance from the mill gate (fig. 9.6). Although satellite chipmills distributed the demand for pulpwood over a wider area in the 1990s, pulpwood markets are still much more concentrated geographically than are markets for solid wood. The raw material for production of paper products comes from pulpwood-grade trees, from wood product manufacturing residuals, and increasingly from recycled fiber. Ince (2000) shows that recycled material comprised 37.9 percent of U.S. paper products in 1998, up from 23.9 percent in 1985. This has resulted in a drop in the demand for virgin wood fiber. The amount of recycled material used in U.S. paper manufacturing may have reached a maximum, especially given strong export demand for recovered paper. So it is likely that expanding use of recycled material mitigated demand and price increases during the rapid growth phase (1986 to 1998), but that changes in demand for recycled material have not been a major influence in the adjustment phase (since 1998). Pulping capacity within the region defines the upper limit for pulpwood demand, at least in the short run. Because expanding capacity through construction requires a large commitment of capital (typically in the $2 billion range), trends in capacity provide a strong indicator of current and anticipated demand for pulpwood. 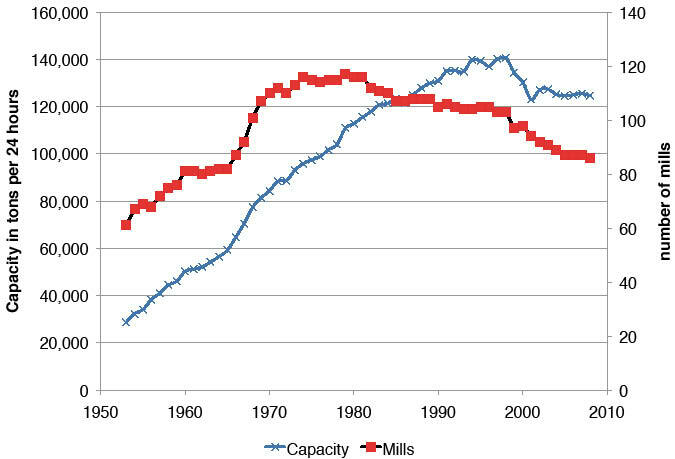 Through 1998, both U.S. and southern pulpmill capacity trended upward (fig. 9.7). Since then, U.S. capacity has decreased only slightly, while Southern capacity decreased by 16 percent before stabilizing in 2003 (fig. 9.8). The rate of decrease in southern capacity was much lower than decreases in the number of paper mills, reflecting an increased concentration of production in remaining plants. 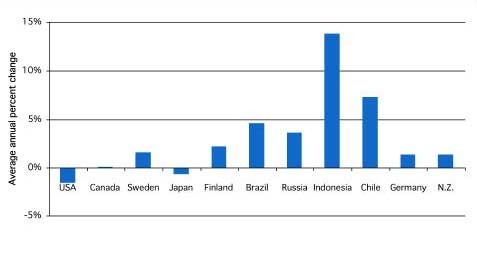 Accompanying these declines in domestic capacity was an expansion in capacity by other countries such a Sweden, Finland, Chile, and Brazil (fig. 9.9). Although the United States and the South continue to lead in pulpwood production, their share of worldwide capacity has declined since 1991. By 2003, pulp capacity in the South had returned to its 1985 level (well short of the 1998 level), where it remained through 2008. New pulpmill capacity and pulp production is feeding increased worldwide (and especially Asian) demand for paper products. With level-to-declining capacity in the United States, it is clear that the new capacity is being developed elsewhere. These changes are likely explained by shifts in comparative advantage resulting from several factors, including labor costs, raw materials costs, and proximity to final product markets, which controls transportation costs. Other contributing factors include the shrinkage of U.S. manufacturing, which requires paper for packaging, and the demand for pulpwood in products like oriented strand board. Manufacturing costs for kraft linerboard (fig. 9.10) provide an example of differences in comparative advantage among regions and countries. The South is competitive in this market compared to the Western United States, Canada, and Europe, but its cost structure lags behind Latin American countries (primarily Brazil and Chile), mainly because fiber and labor costs are significantly lower in less industrialized countries. The South retains comparative advantage because of its proximity to U.S. demand centers (thereby lowering transportation costs), but labor and wood cost differentials make Latin American producers viable competitors. In 1995, 1999, and 2004, both Brazilian and Chilean producers could deliver softwood and hardwood (mostly Eucalyptus) pulpwood to mills at substantially lower cost than producers in the South (fig. 9.11). In 2004, delivered southern softwood pulpwood was 24 percent higher than in Brazil (21 percent for hardwood pulpwood) and 27 percent higher than in Chile (27 percent for hardwood pulpwood). Price differentials are not static however, and prices in Brazil and Chile have risen since 1999. The comparative advantage held by these nations would decrease if this trend were to continue. Figure 9.11—Third-quarter prices for (A) delivered softwood pulpwood and (B) delivered hardwood. 52 percent in 2006. The region’s lumber mills, unlike its pulp and paper mills, are widely dispersed (fig. 9.12). Southern softwood sawmill capacity grew steadily from 1995 to 2005 and then declined slightly through 2009 (Spelter and others 2009), mirroring a strong decline in lumber production associated with the decline in U.S. housing construction (fig. 9.13). Comparable data are not available for hardwood lumber capacity in the South. 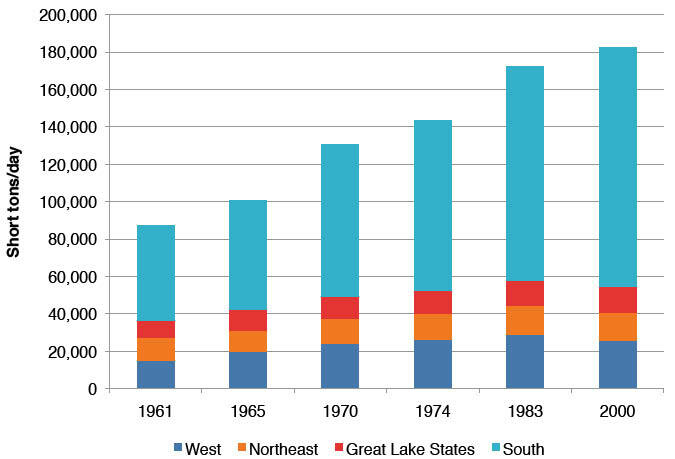 McKeever and Spelter (1998) report that southern panel capacity expanded significantly in the 1990s (fig. 9.14). From 1998 to 2009, oriented strand board capacity nearly doubled (APA-The Engineered Wood Association 2010) from 7,900 to 13,840 square feet (3/8-inch basis), representing 81 percent of total U.S. capacity. 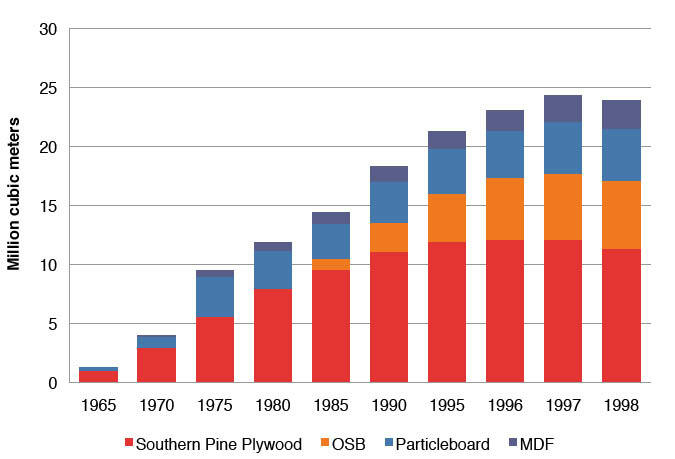 In contrast, southern pine plywood, which dominated panel production through the 1970s, peaked in the 1990s and has since declined (APA-The Engineered Wood Association 2010). At the 1996 peak, plywood capacity was 14,530 million square feet (3/8-inch basis) but fell to 9,190 square feet by 2009 (APA-The Engineered Wood Association 2010). Capacity for medium density fiberboard production grew strongly through the 1990s. More recent data indicate that although southern panel production remained stable from 1996 to 2007 and fell precipitously in 2008/ 2009 because of the 2007 recession and housing market collapse, oriented strand board as a share of production has continued to grow (fig. 9.15). Expanding oriented strand board capacity coupled with declining plywood capacity suggests increasing demand for less expensive, small-diameter timber, especially when compared to the veneer logs used in plywood production. Unlike the demand for paper products, which is most clearly linked to general levels of economic activity, notably manufacturing activity, demand for solid wood products is strongly linked to the construction industry. Housing starts in particular provide a strong correlate to the consumption of solid wood products, and recent economic developments are a strong reminder that the housing market is cyclical. Peaks in housing starts in the early 1970s, in the late 1970s, in the mid-1980s, and in 2006 have all been succeeded by rapid declines of at least 30 percent (fig. 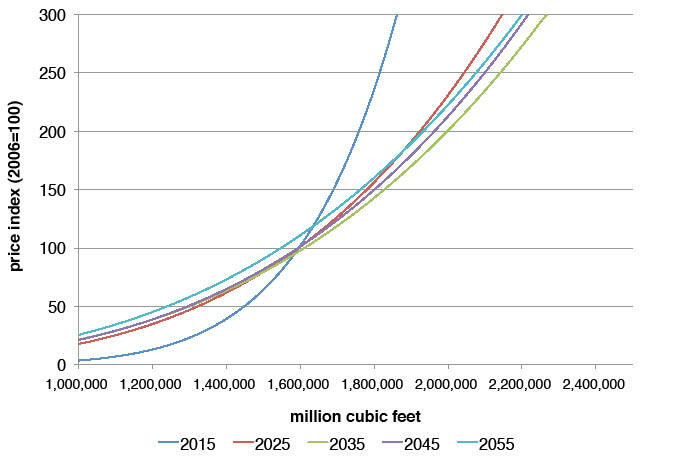 9.16), with these cycles centering on a base level of about 1.5 million units per year. Within this context, the most recent decline and continuing stagnation of housing markets is unprecedented. After exceeding 2 million units in 2005, housing starts fell to 554,000 units in 2009 and (as projected) 619,000 units in 2010 (fig. 9.16), compared to lows that had not dipped below 1 million from 1959 to 2007. The Congressional Budget Office has constructed alternative forecasts of construction activity recovery from the current housing trough that incorporate existing housing stocks, population growth, household formation, depreciation, and employment. The forecasts predicted that housing starts could return to between 1.2 and 1.5 million units by 2012 (Congressional Budget Office 2008), a trend that longer term forecasts predicted would continue. From the perspective of a long run analysis, this forecasted stability suggests recovery and subsequent stability in demand for solid wood products used in construction. In addition, the expansion in the overall number and age of existing residences may bring increased upkeep and repairs, stimulating a gradual expansion in demand for wood. More recent data indicate that the recovery of construction activity projected by the Congressional Budget Office has yet to be realized. In March 2011, the U.S. Census Bureau (2011) estimated new private housing starts at a seasonally adjusted 479,000 units, considerably lower than the housing starts recorded in 2009 and 2010. The time-path of a recovery in housing influences the future of solid wood products demand. With a sustained suppression of housing demand, solid wood processing would likely shrink, eventually resulting in structural changes in these markets. Although necessarily difficult to predict, the implications of sustained suppression might include sustained declines in production capacity, acceleration of changes in engineered wood products, or even shifts in the location of future production. Recovery of housing demand remains a critical short run uncertainty in forecasting U.S. wood product demand. 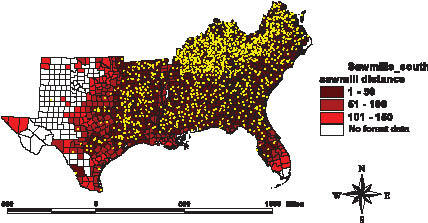 Figure 9.12—Average distance in miles by southern county from the forested center of the county to the closest five sawmills within 150 miles, with yellow dots representing sawmills; note that the universe of all sawmills within the United States were used in the distance calculation. Wood is one of the many commodities that are used to produce final consumer products such as homes or paper and related products. Therefore, the demand for wood products is derived from the demand for final products into which they are a material input. Wood products compete with other construction inputs such as concrete, steel, aluminum, plastics, or other fibers. We therefore need to account for these commodities when evaluating changes in wood products markets. We also need to account for the continued growth in the use of engineered wood products, such as oriented strand board, which can utilize smaller diameter trees, as substitutes for traditional wood products. The potential for substitutions between timber and other materials depends on the level of technology and relative prices of competing material inputs. Substitution away from paper for personal products (e.g., tissue) may be limited, but competition from plastic bags has clearly reduced demands for paper bags in the United States. The use of electronic media has similarly substantially reduced demands for newsprint. Even during the rapid growth phase of 1986 to 1998, use of lumber in the United States did not grow at the same rate as housing starts. Increasing prices of timber compared to steel and cement resulted in substitutions during the last few decades of the 20th century. Very recent upturns in cement and steel prices may portend a moderating or reversal of substitutions (fig. 9.17). Although many factors contribute to price differences among raw materials, energy prices will have a strong influence on the future competitive position of wood. Generally, energy costs associated with production of steel and cement are higher than those associated with production of solid wood construction materials. It is therefore possible that recent upsurges in energy prices could have a positive influence on demand for domestically produced construction wood, relative to its substitutes. 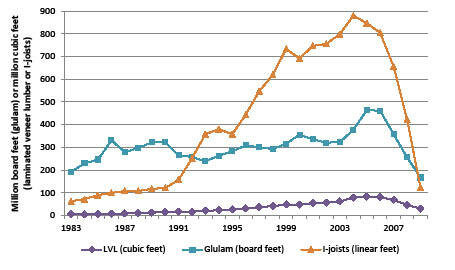 Changing shares of construction inputs reflect shifting prices of non-wood and wood substitutes compared to solid wood. From 1995 to 1998, lumber lost market share in construction generally, and slid from 93 to 83 percent in wall framing (Fleishman and others 1999). Most of these losses could not be attributed to non-wood substitutes, but instead, to engineered wood products—laminated beams, wood I-joists, and laminated veneer lumber (fig. 9.18)—and somewhat to steel, reinforced concrete, and wood-plastic lumber. From 1991 to 2005, laminated veneer lumber production grew with no instances of decline in its market share, although since 2005 its use has declined significantly, along with glulam and I-joists. Lumber also lost market share in roof and floor applications during the 1990s (Fleishman and others 1999). All of these changes demonstrate the wide variety of solid wood products and the key roles played by technological innovation in determining wood use in both the past and the future. Substitution away from forest products is only one explanation of reduced market share for U.S. forest products (Fleishman and others 1999; Zhang and Buongiorno 1997, 1998). Other determining factors were import increases, technological change, and evolving consumer preferences. In paper manufacturing, for example, information technology continues to shift news coverage away from newspapers and toward electronic media, with important implications for paper demand. In addition, the decline in demand for unbleached kraft pulp and other softwood pulpwood products is partially because of recent steep declines in U.S. paper bag manufacture and consumption. 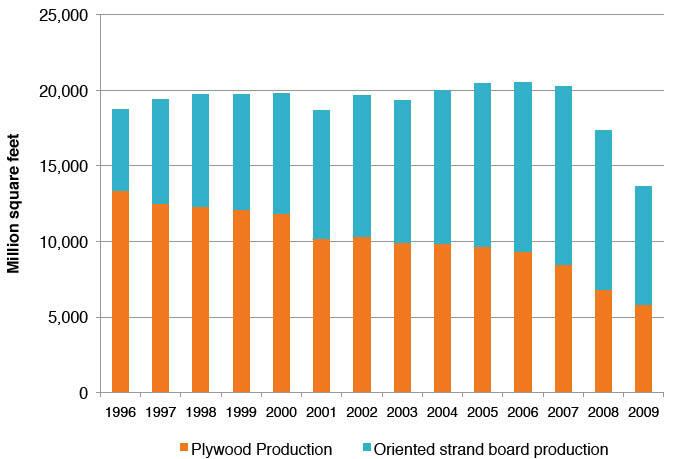 Figure 9.18—Production of engineered wood products, 1983 to 2009. The United States is the world’s largest importer and producer of forest products and the second largest exporter (fig. 9.19). Imports and exports of raw and value-added forest products can directly affect U.S. demand for timber, with increased imports often reducing demand and helping to depress domestic stumpage prices both in the short and long run. Trade in forest products needs to be viewed in the context of international economic conditions. 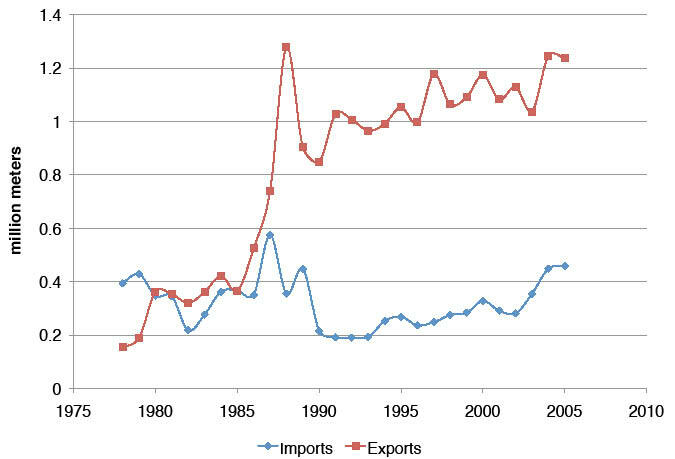 Although there are many reasons for changes in trade flows, the increase in imports and rising U.S. trade deficit in forest products during the 1990s was likely tied to the rising value of the dollar relative to foreign currencies (fig. 9.20). Economic doctrine suggests that exports increase and imports decrease when a domestic currency weakens. 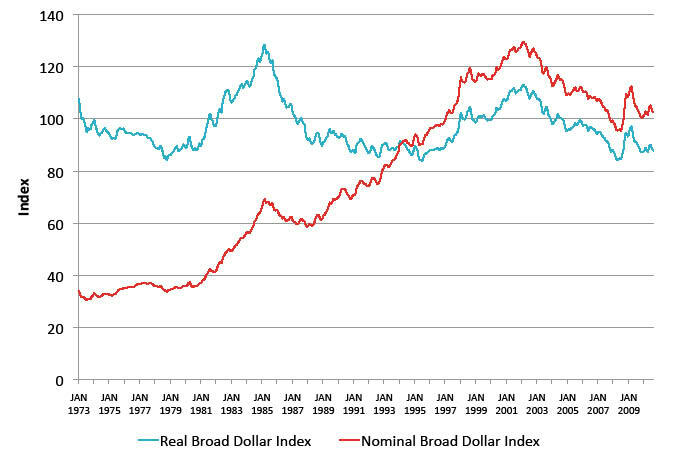 Since 2002, the relative value of the dollar declined, which suggests that the position of U.S. manufacturers improved. 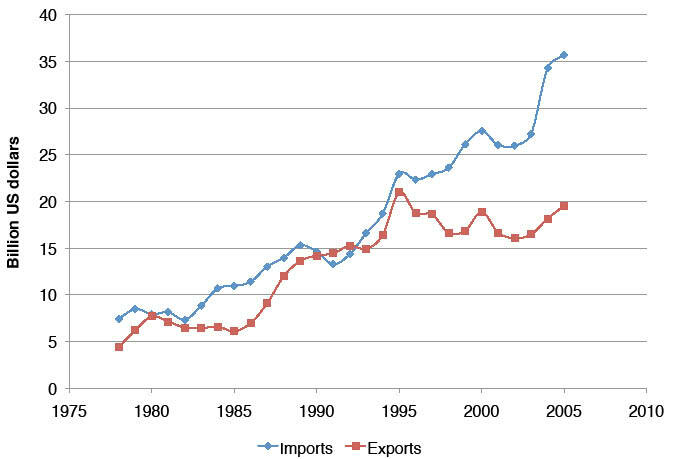 However, changes in exchange rates take time to alter trade flows, and some evidence suggests that exchange rate shifts have only a small long run effect on forest products trade, because other production costs and supply-and-demand factors adjust to accommodate them (Uusivuori and Buongiorno 1991). Wood pulp—Although the overall U.S. balance of trade in wood pulp has been roughly even in recent years (with imports equaling exports), southern ports exported approximately 7 times what was imported (fig. 9.21). From 1989 to 2003, Canada was the largest and Brazil the second largest source of U.S. imported wood pulp. 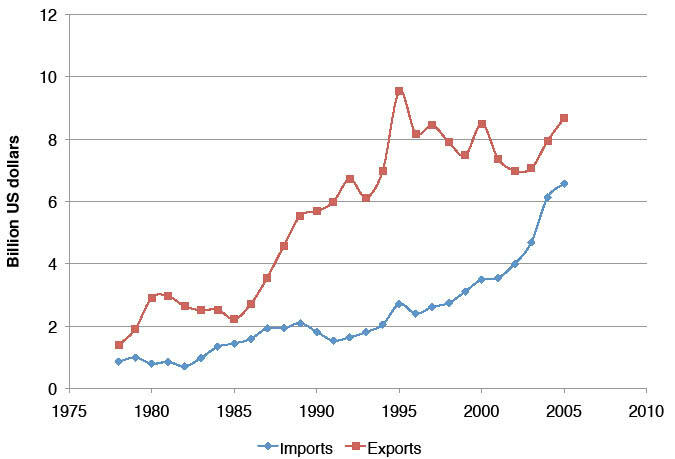 Brazilian imports into southern ports rose sharply since the early 1990s and account for nearly all imports. Still, overall imports into Southern States in 2004 only accounted for between 2 and 3 percent of total southern wood pulp consumption. For southern pulpwood producers, the level of Brazilian imports—primarily hardwood pulp—factors mostly into local markets and are used to meet specific furnish demands. Wood chips—Unlike patterns of trade in wood pulp, patterns of trade in wood chips have changed substantially since the late 1980s. Until 2003, Canada was the leading source of imported U.S. wood chips, supplying pulp and paper manufacturers in the North. After peaking in 1997, Canadian wood chip sales to the United States have declined to less than a third of their peak level. Producers in the southern hemisphere have also supplied hardwood wood chips to the United States at various times (note that the level of softwood chip imports and exports is largely inconsequential). In the mid-1990s, Chile supplied as much as a third of total wood chip imports into the United States. In 2004, Brazilian imports increased more than fivefold compared to 2003, making Brazil the largest supplier of wood chips imported into the United States. Brazilian imports are delivered mainly to southern ports and account for nearly all the imports to southern ports (fig. 9.22). Imports represented only about 0.9 percent of total southern pulpwood consumption and about 3 percent of total southern hardwood pulpwood consumption in 2004. Most enter the United States at Mobile, AL, and a few ports in Florida, potentially having significant localized impacts on hardwood markets near these ports. The surge in Brazilian chip imports is the expected response to domestic price increases resulting from local scarcity of hardwoods—recall that hardwood pulpwood prices remained high through the 2000s. In addition, Eucalyptus chips, a highly preferred fiber source for some paper grades, may out-compete native hardwoods for some applications. The extent to which hardwood chip imports from South America might increase over the coming years is unknown. However, it is likely that the price of chip imports from South America now defines a ceiling for domestic hardwood stumpage prices in certain areas of the South. From the beginning of the data series (1989) to 2002, the United States has had a large trade surplus in wood chips (fig. 9.22)—with exports far exceeding imports. Since 1999, however, the trade surplus has fallen steadily, from around 3 million tons in the mid-1990s to less than 0.1 million tons in 2003. From 1991 to 2002, nearly all of the wood chips exported from U.S. southern ports were shipped to Japan. 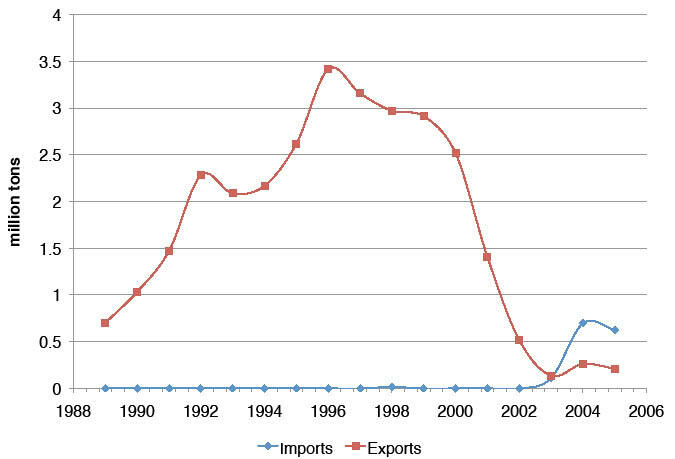 By 2002, chip exports from southern ports essentially ceased. In 2003, the reduction in southern chip exports—primarily hardwood chips—to Japan was equivalent to 5 percent of total southern pulpwood production and nearly 16 percent of southern hardwood pulpwood production. With most of the trade in wood chips moving through Mobile, we might expect the economic impacts of reduced demand to be strongest in Alabama and to decline in an outward radiating pattern. Lumber—Since the late 1980s, the United States has been a large net importer of softwood lumber, primarily from Canada (fig. 9.23). Lumber imports from South America, although relatively small from 1989 to 2004, have been rising steadily. Although the United States exports some lumber, the balance of trade favors imports, and the trade deficit is growing. Imports of lumber from Canada have an important influence on all U.S. timber markets, but the effects on southern markets are likely to be indirect. Lumber from Western Canada more directly substitutes for lumber of species that grow in the Western United States (Nagubadi and others 2004), and imports are generally not directly substitutable for the treated lumber produced in the South. In 2004, the United States led all other temperate countries in producing (60 percent) and consuming (52 percent) hardwood lumber, with about 8 percent of domestic production exported. Hardwood lumber is a much more heterogeneous commodity than softwood lumber, so its production and trade serves a wide variety of end uses—from flooring to furniture to shipping pallets—and aggregate data provide only a very general description of trends. Note that about 10 percent of U.S. hardwood exports are from the Pacific Northwest (especially red alder) compared to about 90 percent from the Eastern United States. Exports of hardwood lumber from the South increased from about 0.4 million m3 in 1989 to just over 1.2 million m3 in 2004 (fig. 9.23)—mostly to other North American countries, followed by East Asia and the 27 countries of the European Union (see fig. 9.24), and with about 10 percent going to all other countries combined. 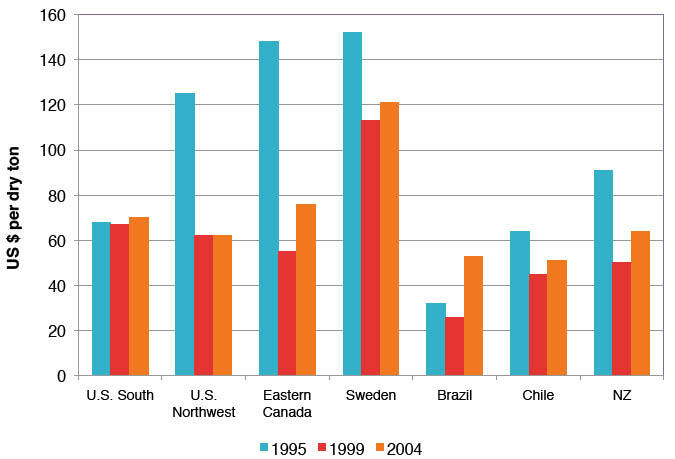 The distribution of exports among these destinations has changed somewhat since 1989, with shipments to Europe declining and shipments to other Canada and Mexico increasing substantially (fig. 9.24). Shipments to East Asia have been essentially constant in aggregate, with a changing mix of individual country destinations and large increases in shipments to China offset by decreases in shipments to other Asian countries. The 2007 recession led to a strong decline in total hardwood exports with the distribution among destinations remaining relatively constant (fig. 9.24). Southern exports of softwood lumber have been relatively small and have declined over the last decade (fig. 9.25), falling to about a third of 1992 levels in 2004 and now representing only 1 to 2 percent of total production. Panels—Trade in panel products is weighted toward imports, with about 15 percent of plywood consumption and 38 percent of oriented strand board consumption imported from Canada and other countries in 1999 (Spelter 2001). Particleboard, waferboard, and oriented strand board imports from Canada grew strongly through the mid-2000s, increasing from $1.53 billion in 1999 to $3.16 billion in 2004, before decreasing substantially at the end of the decade (APA-The Engineered Wood Association 2010) U.S. exports of panels cannot be considered negligible, although they are substantially lower than imports. For example, in 2009, plywood exports were 482 million square feet (3/8-inch basis) compared to 616 million square feet for imports. Oriented strand board trade has been significantly more imbalanced, tilted toward imports (APA-The Engineered Wood Association 2010). Oriented strand board markets expanded through the mid-2000s. North America will likely continue to dominate World production in this commodity class, but the trade balance within North America—especially between Canada and the United States—could change with market expansion. In addition, a decline in demand for southern pulpwood could offer a competitive mill-siting advantage to U.S. manufacturers. Overall, we see no dramatic change in international markets that would strongly affect southern timber demand in the short run. At the national level, the value of wood products imports exceeds exports so the wood products balance of trade is negative. For southern ports, the wood products balance of trade is positive, but a small share of total production. 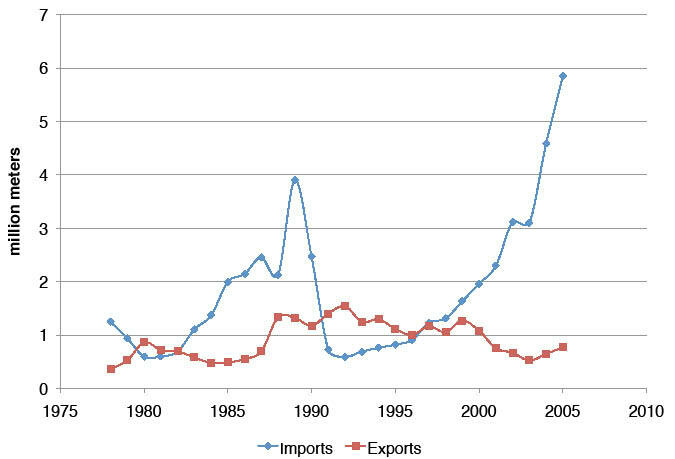 Figure 9.21—Wood pulp imports to and exports from southern customs districts, 1978 to 2005. 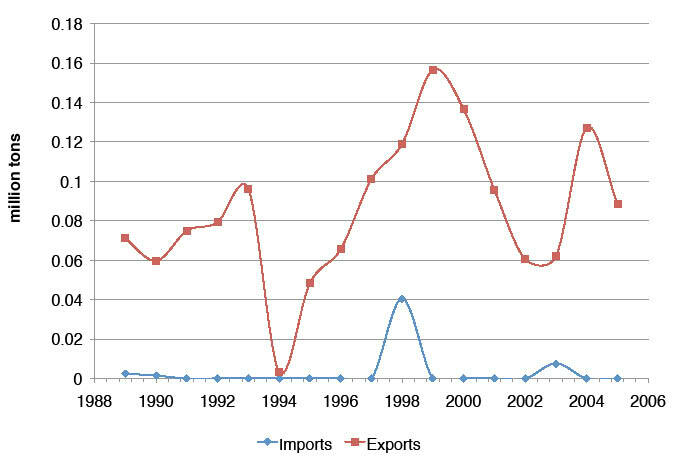 Figure 9.22—Southern customs district imports and exports for (A) softwood wood chips and (B) hardwood wood chips imports, 1989 to 2005. 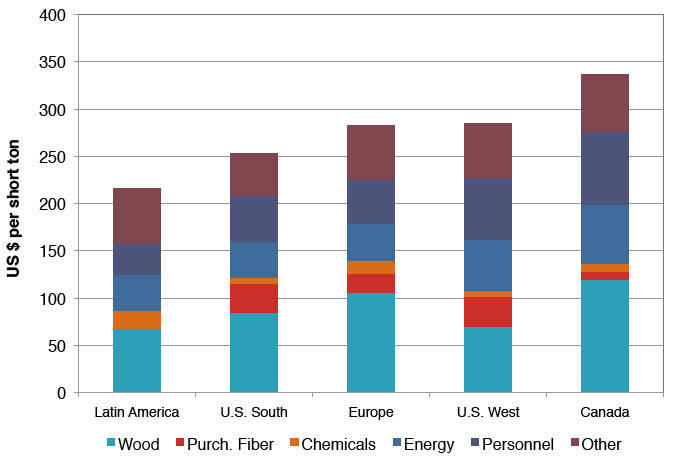 Figure 9.24—Exports of U.S. hardwood lumber to various regions, 1989 to 2009. Overall, changes during the adjustment phase (1997 to 2009) indicate some important changes in supply. An expanded supply of softwood pulpwood timber coupled with a sustained price reduction is consistent with earlier high levels of tree planting (at least through the mid-2000s). From 1999 to 2010, the area of planted pine increased from 32 to 39 million acres (more than 25 percent) as harvesting of softwood pulpwood declined and then flattened (fig. 9.5). This implies that supply of this product will continue to expand at least over the next 10 to 20 years as the new plantations mature. Price and harvest patterns for softwood sawtimber are not consistent with a decline in supply, indicating that demand shifts dominated this market. In contrast, patterns for hardwood products indicate a tightening of supply. Hardwood pulpwood harvesting has declined steadily since 1998 as prices have risen, reducing supply. This decline in supply is consistent with a loss of manageable upland hardwood forests associated with expanding urban and suburban landscapes. Fundamental factors that will influence the structure of supply include the area of land that remains or becomes forested, as well as the propensity of landowners to harvest their forests and invest in planting and management. The U.S. Forest Assessment System provides integrated projections of these factors and provides some insights into how overall supply might evolve in the future. 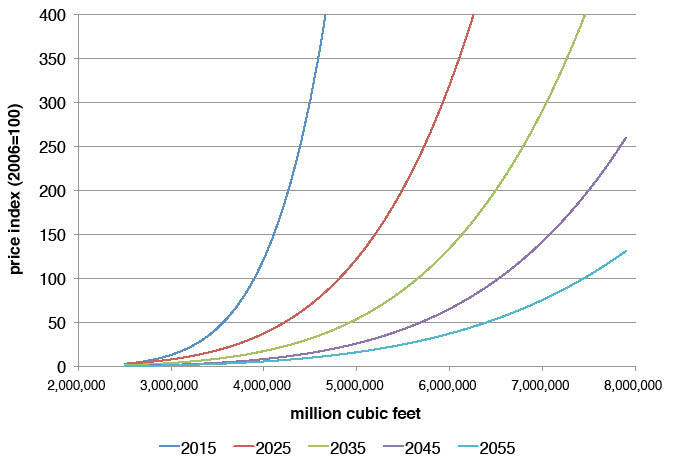 The area of forests in the South is forecasted to decline over all of the Cornerstone Futures evaluated for the Futures Project (chapter 2) with losses ranging between 12 million acres (7 percent) and 23 million acres (13 percent) from 1997 to 2060 (chapter 5). These forecasts reflect a more than doubling of urban land uses, a range of timber price futures, and constant returns for agriculture. The forecasts suggest a shift in the distributions of forest management types. The forecasted area of planted pine varies substantially across the Cornerstones, reflecting a variety of economic conditions and assumptions about the propensity to manage forests. Area of planted pine, which was about 39 million acres in 2010 or about 19 percent of total forest area, is forecasted to range between 47 million acres (24 percent) and 69 million acres (36 percent) in 2060, with all projections reflecting a reduction in the planting compared to the past 20 years (chapter 5). All other forest types are forecasted to decline, with steepest losses in natural pine forest area and steady losses in hardwood types. Declines in hardwood types are most strongly affected by urbanization; declines in the natural pine type are most strongly associated with timber harvesting and conversion to planted pines. 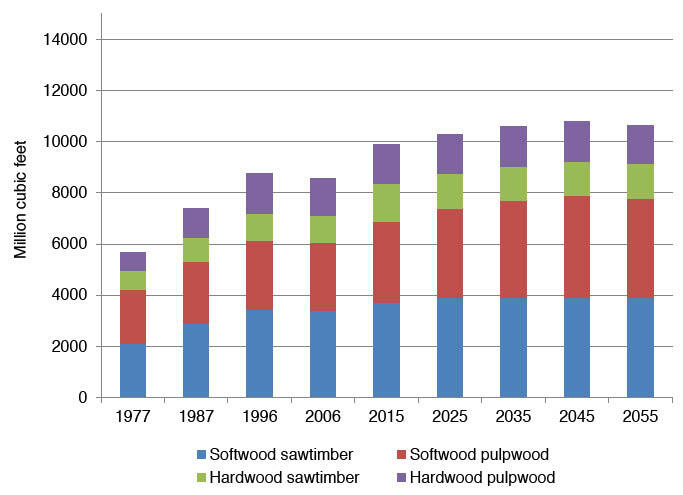 High GDP scenario—Projections of softwood timber supply for the High GDP future are shown in fig. 9.26. Softwood pulpwood supply is forecasted to change over the five decades of the projection. One important element of change is that supply becomes more elastic over time, shifting from an own-price elasticity of 0.13 in 2015 to about 0.22 in 2055, consistent with more supply being derived from planted pine forests than from current demand. The net effect is a steady expansion in the supply function over time. To illustrate, if real prices of softwood pulpwood are held constant over time, harvesting would increase by about 17 percent by 2025 and by 44 percent by 2055. A doubling of prices (to an index value of 200) to near-1990s levels would yield an increase in harvesting of about 69 percent by 2055. Projected growth in softwood pulpwood supply reflects both the expansion in plantations since 1999 and a modeled continuation of expansion in planted pine. 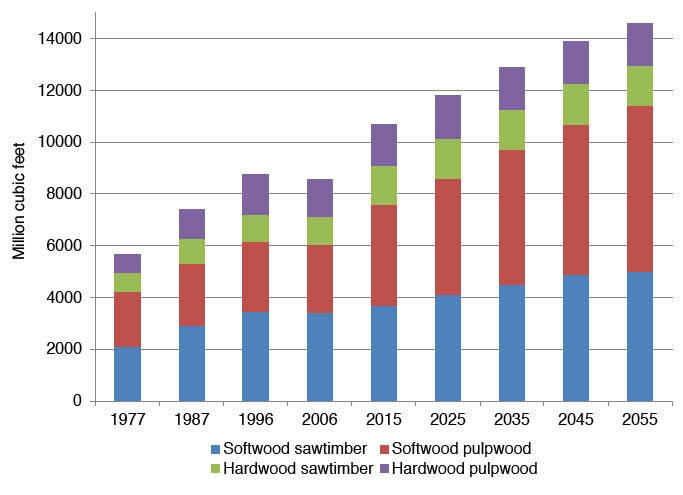 Softwood sawtimber supply also expands, but only until 2025 (fig. 9.26), and the change in elasticity is smaller, ranging between 0.18 and 0.23. With constant real prices, softwood sawtimber harvesting would increase about 6 percent by 2025 and 8 percent by 2055. A doubling of prices would yield a 14-percent increase in softwood sawtimber harvests in 2055. Softwood sawtimber supply shifts as existing inventories mature and more natural pine forests are replaced by planted pines. Projections of hardwood timber supply differ from the softwood projections (fig. 9.27). Hardwood pulpwood supply expands slightly from 2015 to 2025 (becomes less inelastic) but then begins to contract over the remainder of the projection period. Constant prices would decrease harvesting by about 6 percent from 2015 to 2055, and a doubling of prices would result in a 16-percent increase. 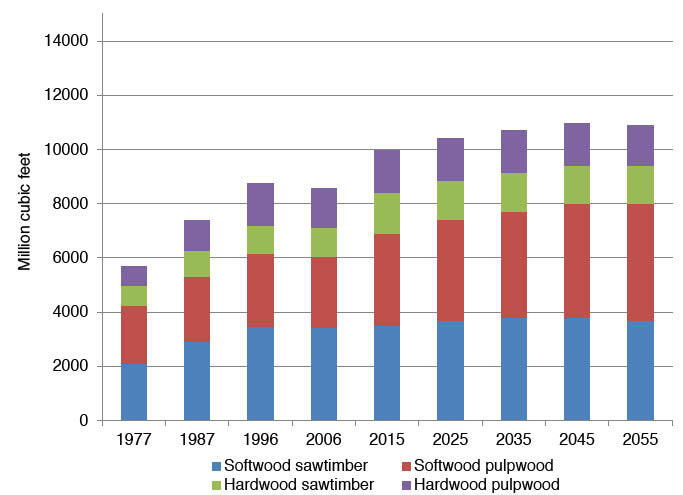 Hardwood sawtimber supply shows a similar pattern, with an increase in elasticity through 2025, followed by a steady contraction over the remainder of the projection period. Constant prices would decrease harvesting by 3 percent from 2015 to 2055, and a doubling of prices would result in a 22-percent increase. Under High GDP scenarios then, hardwood supply does not change in any appreciable way after 2025. 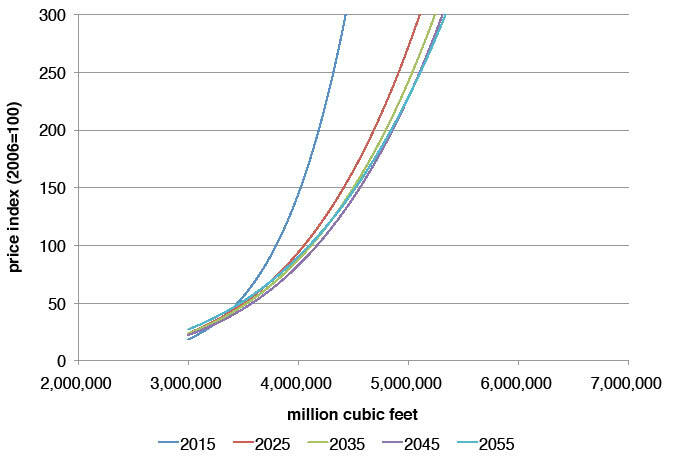 Low GDP scenario—Projections of supply for the Low GDP future (figs. 9.28 and 9.29) are similar to High GDP, but the magnitude of change is smaller. For example, with constant prices, softwood pulpwood supply would be about 20 percent lower for Low GDP, and hardwood supply would be slightly higher reflecting less urbanization (and greater areas of hardwood forest types). The Enhanced Productivity scenario shows the effect of a 50-percent increase in productivity for planted pine forests by 2055. 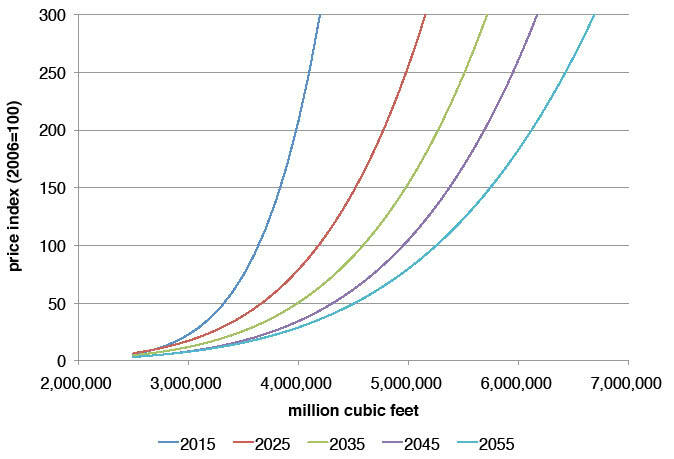 Under this scenario, the supply functions for softwood pulpwood would expand by a substantial amount (fig. 9.30). With prices held constant, pulpwood harvesting would increase by about 75 percent; a doubling of price would nearly double harvesting. Softwood sawtimber supply would also expand, with increased production of chip-and-saw products from planted pine forests. Recent changes in ownership—Most notably the transfer of vast forest holdings from the forest products industry to timber investment management organizations and real estate investment trusts, but also the gradual transitions in family forest ownership—suggest that owner preferences could shift substantially in the future. Although no associated changes in management approaches and investment patterns have been detected yet, this is a key and unaddressed source of uncertainty in our analysis. Chapter 6 provides a discussion of ownership transitions and the potential implications for forest management and conditions. 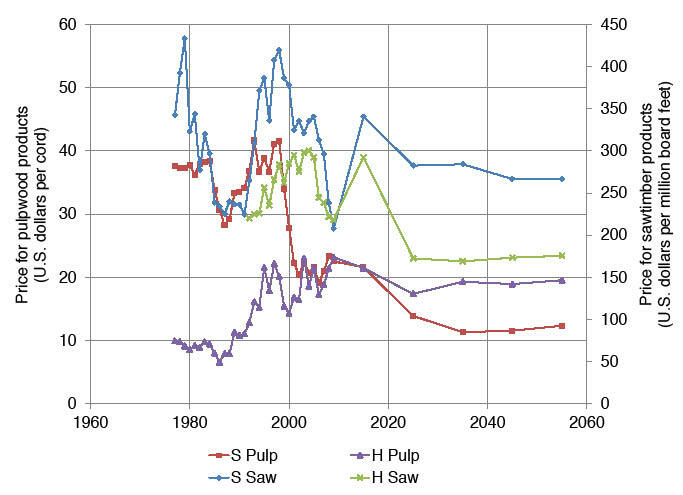 Figure 9.26—Projected softwood (A) pulpwood and (B) sawtimber timber supply curves, 2015 to 2055, associated with high Gross Domestic Product futures. 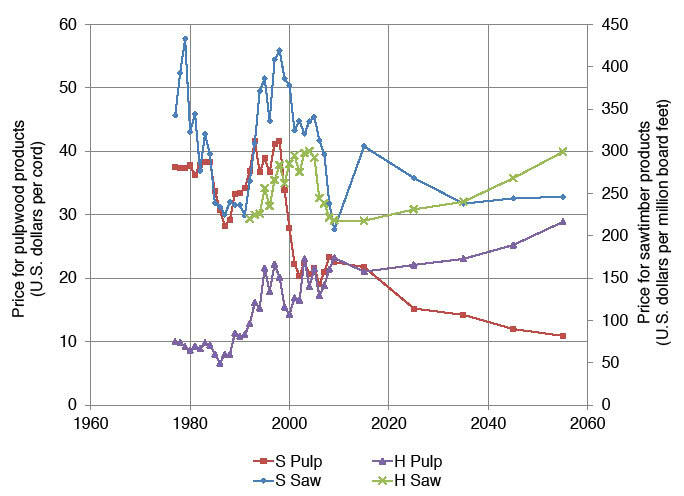 Figure 9.27—Projected hardwood (A) pulpwood and (B) sawtimber timber supply curves, 2015 to 2055, associated with high Gross Domestic Product futures. 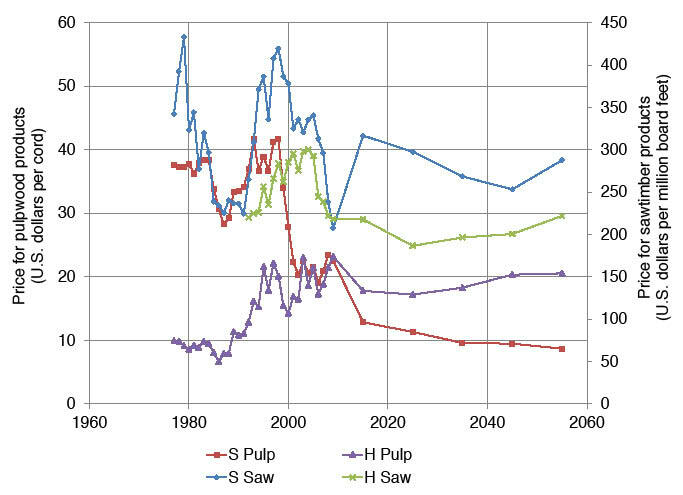 Figure 9.28—Projected softwood (A) pulpwood and (B) sawtimber timber supply curves, 2015 to 2055, associated with low Gross Domestic Product futures. 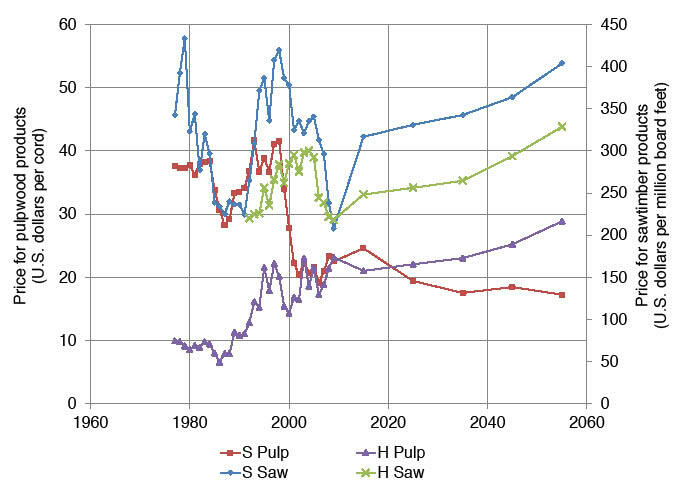 Figure 9.29—Projected hardwood (A) pulpwood and (B) sawtimber timber supply curves, 2015 to 2055, associated with low Gross Domestic Product futures. Figure 9.30—Softwood pulpwood supply projections under enhanced productivity. The interaction of supply and demand defines current and future timber harvesting and timber prices. In forecasting future timber markets for the South, we compared the timber supply relationships developed from the U.S. Forest Assessment System (figs. 9.26–9.29) with two different assumptions about forest product demand. Recall that we model three different supply scenarios: a High GDP case based on the strong economic and moderate population growth projections of Cornerstones A and B (A1B storyline in the 2010 RPA Assessment); a Low GDP case based on the weak economic and low population growth projections of Cornerstones C, D, and F (B2 storyline in the 2010 RPA Assessment); and an Enhanced Productivity case based on High GDP and the 50-percent productivity increase from planting pines over the 50 years (Cornerstone E). Standing timber harvest and price forecasts for the Constant Demand/High GDP supply scenario are shown in figure 9.31. Over the next 50 years, harvesting would increase by about 27 percent from the 2006 level, with softwoods outpacing hardwoods and with a leveling off beginning in the 2030s. Softwood sawtimber prices would return to their 2006 levels by 2015 and then decline somewhat over the projection period. Softwood pulpwood prices would fall substantially as supply expands throughout the period, but hardwood pulpwood prices would remain relatively constant throughout. When the Constant Demand scenario is combined with Low GDP, harvesting patterns would be similar to High GDP, but prices would be somewhat higher (fig. 9.32). Also, somewhat more softwood sawtimber and somewhat less softwood pulpwood would be produced in the later years of the simulation. Harvesting and price forecasts for the Expanding Demand/High GDP scenario are shown in figure 9.33. Harvesting would expand throughout this forecasting period, with especially strong growth for both softwood products and for hardwood sawtimber. 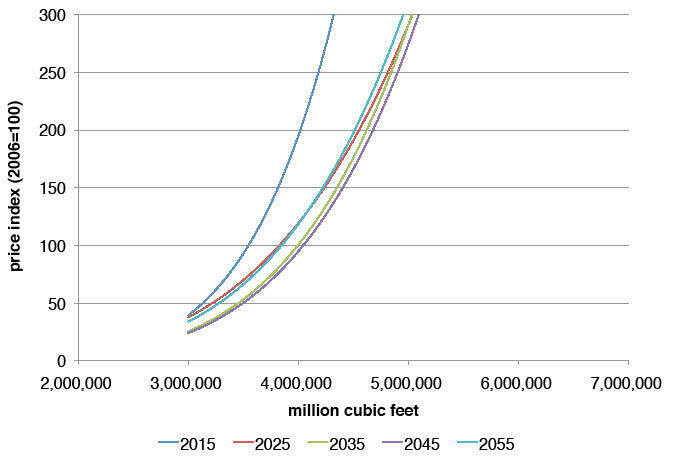 By 2055 harvesting would be about 43 percent higher than the 2006 level. Prices would rise, reflecting increased scarcity—about 120 percent for softwood sawtimber and 34 percent for hardwood pulpwood—and softwood pulpwood prices would return to about 80 percent of the 2006 level. Scarcity would increase for all forest products except softwood pulpwood. Combining Expanding Demand with Enhanced Productivity yields qualitatively different results. 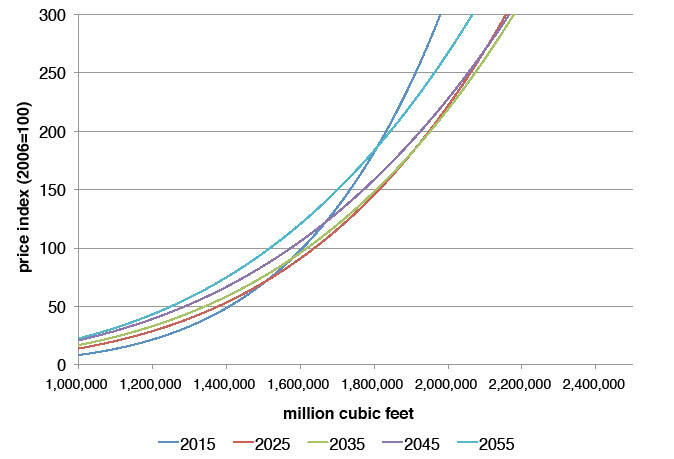 Harvesting would increase by about 70 percent from 2006 to 2055 (fig. 9.34), with all additional production coming from softwood products. Softwood pulpwood harvesting would more than triple and its price would fall by about 50 percent. Harvesting of softwood sawtimber would increase by about 46 percent and its price would fall by about 27 percent. Hardwood pulpwood would become increasingly scarce with prices rising by slightly less than 1 percent per year. The price trajectory for the Constant Demand scenario is consistent with the Cornerstone Futures that feature declining prices (Cornerstones B and D). The Expanding Demand scenario generates market outcomes that are more similar with the Cornerstone Futures that feature increasing prices (such as Cornerstone A), although the forecasted price increases for the Expanding Demand scenario are not quite as high. The results suggest that, at least considering the progression of markets for traditional forest products, the Cornerstone Futures bracket a reasonable range of market forecasts. The Enhanced Productivity scenario indicates a higher production potential within the South, which could accommodate more substantial demand growth in softwood products, especially for pulpwood. Figure 9.32—Forecasts of (A) standing timber harvesting and (B) real timber prices (2009=100), combining a Constant-Demand scenario with a Low-Gross Domestic Product supply scenario. High-Gross Domestic Product supply scenario. Figure 9.34—Forecasts of (A) standing timber harvesting and (B) real timber prices (2009=100), combining an Expanding-Demand scenario with an Enhanced-Productivity supply scenario. Strong growth in timber productivity from the 1960s to the late 1990s gave the South a strong comparative advantage in a variety of timber product markets. Output expanded for all products but it was especially strong for softwood sawtimber and pulpwood as intensive pine management replaced harvesting from naturally regenerated forests. 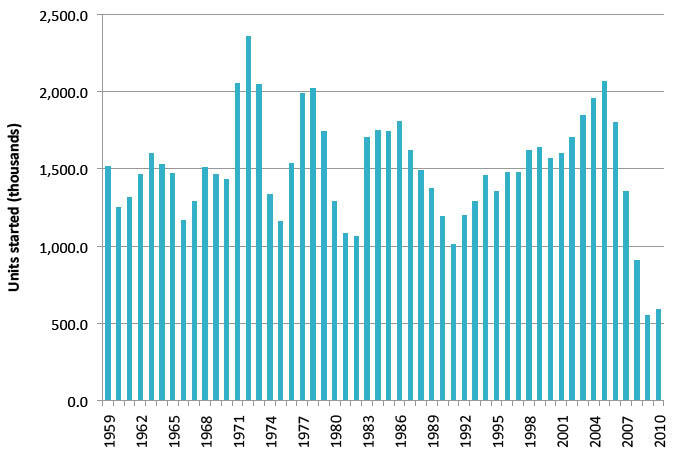 Total production doubled from 1962 to 1987 and continued to grow through 1997. The region now produces more timber than any single country in the world, and its product mix is highly diverse. Beginning in the late 1990s, production relationships changed in the South, with output leveling off or falling after a long period of sustained growth. Our analysis suggests that this leveling off was largely driven by a reduction in demand. Pulp and paper capacity in the United States and in the region, after declining at the turn of the century, have leveled off over the past several years. The recent housing downturn substantially reduced demand for sawlogs throughout the country, including the South. At the same time, investments and changes in forest productivity significantly increased the supply of timber products from the South, even during the adjustment period of 1998 to 2009. Softwood pulpwood prices halved from 1998 to 2001 in response to a 10-percent decline in production, and have not recovered since. This is consistent with the coincident expansion in the area of planted pine forests from about 32 million acres in 1999 to about 39 million acres in 2009. The expansion in planted area not only explains recent market dynamics, but also foretells future market changes in the region. In contrast to softwoods, hardwood products, especially hardwood pulpwood, have become scarcer in the South. Little active management is applied to produce hardwoods, and practically none of the region’s supply is in planted hardwood forests. Looking to the future, timber supply will be reshaped by a number of factors, including land use and land ownership. Urban growth is forecasted to consume several million acres of timberland from 2010 to 2060, with much of the losses concentrated in the Piedmont and along the coasts. Hardwood forest types, especially upland hardwoods, would be most impacted by urbanization. Forest ownership is a source of uncertainty. The forest products industry, which until recently owned a large majority of the most productive and heavily managed lands, sold most of its holdings over the past decade, with most forests still in production but with a very different set of owners. Forecasts of the impacts of this ownership change on investment can only be speculative at this point, but will play an important part in determining future supply. Forecasts of supply indicate a substantial expansion in softwood supply over the next decade as new pine plantations mature. This portends continued low prices for softwood products, especially softwood pulpwood. Beyond 2020, supply depends on a much lower rate of expansion in forest plantations—generally the rate of planting harvested forests is assumed to be about half of what it was in the 1990s. Even at these lowered levels, the supply of timber would grow and the price of products would generally decline if demand does not grow over the next decades. While supply growth could also be affected by policy changes affecting future management options—e.g., potential restrictions on the use of herbicides for site preparation—our analysis focuses on a future with no substantial changes in policy environment. Policy changes could lead to different outcomes. Growth in harvesting can be supported by the forest land of the South. A return to 1990s demand levels would result in a price stabilization for softwood pulpwood prices and an increase of less than 1 percent per year for softwood sawtimber and hardwood pulpwood, as well as an increase in total output of about 40 percent from 2006 to 2055. If, in addition, productivity in pine plantations grows by 50 percent, then output could increase even more substantially—up to 70 percent for softwood pulpwood. Demand is perhaps the most crucial uncertainty in this analysis. Current demand is suppressed by the unprecedented fall in housing construction in 2008, and by long run phenomena, such as the decline in paper production capacity in the South in line with broader economy-wide shifts that are impacting the timber products industry and global capacity shifts. Recovery from the 2007 recession will strongly affect the course of future demand, but policy developments may also play a role. Incentives for using renewable biomass in various bioenergy operations could provide a potentially large new demand for timber products in the South (chapter 10). What is clear from our analysis is that, absent renewed growth in demand for traditional southern forest products, production growth could be sustained in support of new markets without substantial increases on timber prices, although regional stability could coincide with important scarcities in local timber markets, for example if some individual States develop their own Renewable Portfolio Standards. The question that remains is, “How much?” Without productivity gains, the largest projections of demand for wood-based bioenergy products (under strong economic and moderate population growth projections of Cornerstones A and B, and the A1B storyline in the 2010 RPA Assessment) outlined by the U.S. Department of Energy and described in chapter 10 would lead to large price increases (as much as 400 percent by 2055). With the 50-percent productivity growth for plantations, this demand could more readily be accommodated without strong price increases, even with existing industries consuming their current levels of timber products. Under the Expanding Demand scenario and holding pulpwood consumption for existing industries at 2006 levels, an additional 2.4 billion cubic feet or 36.6 million green tons per year of softwood pulpwood harvesting are forecasted for 2055. Combining Enhanced Productivity to the above scenario would increase softwood pulpwood harvesting to 3.7 billion cubic feet or 57.9 million green tons per year. In summary, the South has the capacity to expand production well into this century, but demand for forest products seems to be a limiting factor. Timber supply has continued to grow while demand has slackened over the past decade, inducing disinvestment in pulp and paper manufacturing and slower investment in other wood products by the forest products industry. Given this reality, the future of timber markets will largely be determined by demand growth that would emerge primarily from the requirements of forest fiber inputs to supply bio-based energy. Our market models are based, to the extent possible, on empirical models of biological changes and management behavior. One area where empirical models have not proved sufficient is in forest investments. Better information on how various owner and investor groups adjust their management plans, particularly by expanding tree planting in response to market signals, could reduce the uncertainty of market projections. Better models of the demand for final wood products and timber inputs to their production could also improve market projections. Change in the ownership of forests is another key source of uncertainty. Given the information at hand, we assume that the management objectives and management models of timber investment management organizations are similar to those of the vertically integrated forest products companies that they have replaced over the past 10 years (chapter 6). Little is known about the broader implications of these changes in ownership and associated changes in management strategies for the land that has been transferred. For example, the productivity of planted forests derives from other treatments, including fertilization, weed control, and thinning which have not been modeled here. We have assumed that management strategies have not been greatly impacted by these changes, but this remains an untested hypothesis. Past attempts to model southern timber markets have been successful because of the dominance of private owners. Our models indicate that forest harvesting can be modeled as a function of market signals and is therefore predictable. However, an important uncertainty may well be the development of new demands for bioenergy and biofuels that are driven, not by markets, but by new State and Federal policies, which are unknowable at this point. In addition, the spatial scope of our models addresses the region’s timber markets as one entity, given the current distribution of production demands and forest management types. However, policies at the State level, especially State Renewable Portfolio Standards, may create local demands that could result in local scarcities and a spatial realignment of production; these we cannot address with our models. Thanks to Shan Liu, Southern Research Station, U.S. Department of Agriculture Forest Service; Ruhong Li, Department of Forestry and Management, University of Wisconsin, Madison; and Robert C. Abt, Department of Forestry and Environmental Resources, North Carolina State University. APA-the Engineered Wood Association. 2010. Structural panel and engineered wood yearbook. APA Economics Report E176. Tacoma, WA: American Plywood Association. 80 p.
Congressional Budget Office. 2008. The outlook for housing starts, 2009 to 2012. Background Paper. U.S. Congress, Congressional Budget Office. 23 p. http://www.cbo.gov/ftpdocs/98xx/doc9885/11-17-HousingStarts.pdf. [Date accessed: October 28, 2010]. Daniels, J.M. 2008. United States trade in wood products, 1978–2005. Gen. Tech. Rep. PNW-GTR-738. Portland, OR: U.S. Department of Agriculture Forest Service, Pacific Northwest Research Station. 124 p.
Fleishman, S.J. ; Eastin, I.L. ; Shook, S.R. 1999. Material substitution trends in residential construction, 1995 vs. 1998. Center for International Trade in Forest Products Working Paper Number 73. Seattle: University of Washington. 76 p.
Ince, P. 2000. Industrial wood productivity in the United States, 1900-1998. Res. Note FPL-RN-0272. Madison, WI: U.S. Department of Agriculture Forest Service, Forest Products Laboratory. 14 p.
Johnson, T.G. ; Steppleton, C.D. 2005. Southern pulpwood production, 2003. Resour. Bull. SRS-101. Asheville, NC: U.S. Department of Agriculture Forest Service, Southern Research Station. 38 p.
Johnson, T.G. ; Steppleton, C.D. ; Bentley, J.W. 2010. Southern pulpwood production, 2008. Resour. Bull. SRS–165. Asheville, NC: U.S. Department of Agriculture Forest Service, Southern Research Station. 42 p.
McKeand, S.; Mullin, T.; Byram, T.; White, T. 2003. Deployment of genetically improved loblolly and slash pines in the South. Journal of Forestry. 101(3): 32-37. McKeever, T.; Spelter, H. 1998. Wood-based panel plant locations and timber availability in selected U.S. States. Gen. Tech. Rep. FPL-GTR-103. Madison, WI: U.S. Department of Agriculture Forest Service, Forest Products Laboratory. 53 p.
Nagubadi, R.; Zhang, D.; Prestemon, J.; Wear, D.N. 2004. Softwood lumber products in the United States: substitutes, complements, or unrelated? Forest Science. 50(4): 416-426. Norris Foundation. 1977–present. Timber Mart-South State Timber Price Reports. Center for Forest Business, Warnell School of Forestry and Natural Resources, University of Georgia, Athens, GA.
Poylakov, M.; Wear, D.N. ; Huggett, R. 2010. Harvest choice and timber supply models for forest forecasting. Forest Science. 56(4): 344-355. Smith, B.R. ; Rice, R.W. ; Ince, P.J. 2003. 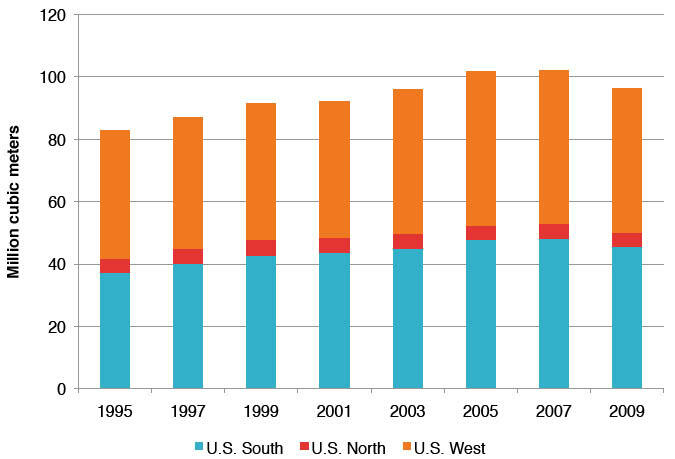 Pulp capacity in the United States, 2000. Gen. Tech. Rep. FPL–GTR–139. Madison, WI: U.S. Department of Agriculture Forest Service, Forest Products Laboratory. 23 p.
Smith, W.B. ; Miles, P.D. ; Perry, C.H. ; Pugh, S.A. 2009. Forest resources of the United States, 2007. Gen. Tech. Rep. WO-78. Washington, DC: U.S. Department of Agriculture Forest Service. 336 p.
Smith, W.B. ; Miles, P.D. ; Vissage, J.S. ; Pugh, S.A. 2004. Forest resources of the United States, 2002. Gen. Tech. Rep. NC-241. St. Paul, MN: U.S. Department of Agriculture Forest Service, North Central Research Station. 137 p.
Smith, W.B. ; Vissage, J.S. ; Darr, D.R. ; Sheffield, R.M. 2001. Forest resources of the United States, 1997. Gen. Tech. Rep. NC-219. St. Paul, MN: U.S. Department of Agriculture Forest Service, North Central Research Station. 190 p.
Spelter, H. 2001. Wood-based panels—supply, trade and consumption. In: ECE/FAO Forest Products Annual Market Review 1999-2000:113-130. Chapter 10. Spelter, H.; McKeever, D.; Toth, D. 2009. Profile 2009: softwood sawmills in the United States and Canada. Res. Pap. FPL-RP-659. Madison, WI: U.S. Department of Agriculture Forest Service, Forest Products Laboratory. 55 p.
U.S. Census Bureau. 2011. Press release: new residential construction in February 2011. March 16, 2011. http://www.census.gov/const/www/newresconstindex.html. [Date accessed: April 5, 2011]. Uusivuori, J.; Buongiorno, J. 1991. Pass through of exchange rates on prices of forest product exports from the United States to Europe and Japan. Forest Science. 37(3): 931-948. Wear, D.N. ; Carter, D.R. ; Prestemon, J. 2007. The U.S. South’s timber sector in 2005: a prospective analysis of recent change. Gen. Tech. Rep. SRS-99. Asheville, NC: U.S. Department of Agriculture Forest Service, Southern Research Station. 29 p.
of Forest Research. 13: 54-65. Zhang, Y.; Buongiorno, J. 1997. Communication media and demand for printing and publishing papers in the United States. Forest Science. 43(3): 362-377. David N. Wear is the Project Leader, Center for Integrated Forest Science, Southern Research Station, U.S. Department of Agriculture Forest Service, Raleigh, NC 27695; Jeffrey Prestemon is a Research Forester at the Forest Economics and Policy Research Work Unit, Southern Research Station, U.S. Department of Agriculture Forest Service, Research Triangle Park, NC 27709; Robert Huggett is a Research Assistant Professor, Department of Forestry and Environmental Resources, North Carolina State University, Raleigh, NC 27695; Douglas Carter is a Professor, School of Forest Resources and Conservation, University of Florida, Gainesville, FL 32611.